‘Art is elitist’ is a common accusation levelled at art: a ‘taste terror’ that nobody wants, imposed by ‘so-called experts’. ‘Citizens are always obstructive when it comes to art’, is a common suspicion from the other side. It is for this reason that some call ‘art and public participation incompatible’. This edition of Rotterdam Cultural Histories offers a rather different story. Using three examples, we show how the people of Rotterdam cherish their city’s sculptures, lobbying and campaign for them and, if necessary, adopting them. 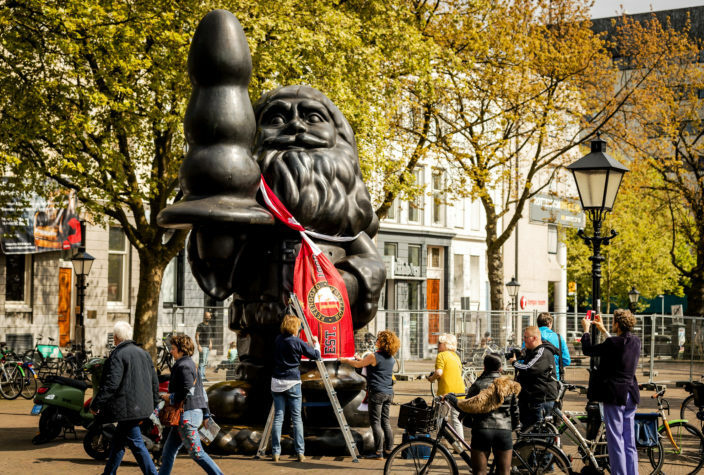 We focus on ‘Jan Gat’ (the popular name for Ossip Zadkine’s The Destroyed City), ‘Kabouter Buttplug’ (Paul McCarthy’s Santa Claus), and ‘De Witte Bollen’ (Hans van der Plas’s Cells). We have made a selection from the wealth of emotions, opinions, news reports, and campaigns concerning these sculptures. Rather than prioritising the perspective of artists or policymakers, this presentation is guided by the responses and views of fellow citizens. Rotterdam Cultural Histories is a collaborative project between Witte de With Center for Contemporary Art and TENT. This long-term project, begun in 2014, articulates conceptual meeting points between the programs of these two institutions, both housed in this building, through the study of their common roots in Rotterdam.